The subject of human rights has been agitated the minds of human beings in all ages at different times of human evolution. Human rights is a dynamic concept, which endeavors to adopt itself to needs of the day. Human rights are generally defined as those rights which every human being is entitled to enjoy by virtue of being a member of human species. 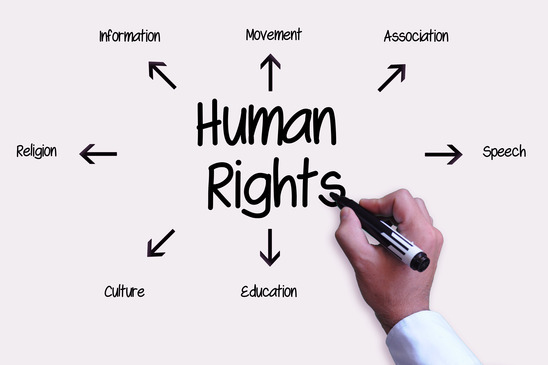 Because of their immense significance to human beings, human rights are also sometimes referred to fundamental rights, basic rights, inherent rights, natural rights and birth rights. Indeed, the human rights are represent in the cultural development of a religion and philosophies in all parts of the world since the dawn of history. The problems of human rights are closely related or existed between man and his social environment, on which a life of an individual depends on the society. It is well noted that according to the Vienna Declaration of Human Rights, 1993, ‘all human rights are universal, indivisible, interdependent and inter-related. The international community must treat human rights in a fair and equal manner globally. Universality: Currently, almost all the individuals are to talk about the human rights. These rights are mostly linked to the fundamental rights and freedoms, which are expressed in their respective constitutions around the world. The concept of human rights an attempt an attempt to protect the individual from oppression and injustices. These rights should provide a human standard of achievement for all the people and all the nations. Internationalization: The subject of human rights is both of an individual as well as of the whole world. The human rights relates to the local, regional, national, and international levels. The recognition, protection and implementation of human rights has been recognized at all levels internationally. The States having become parties to a number of international treaties and agreements that would require codification in the form of national and municipal laws. Subsequent to the establishment of the United Nations, scores of international instruments have been adopted, which spells out the norms and standards to promote universal respect for and an observance of human rights and fundamental freedoms of all. Interdependence: It is to be noted that some human rights are more fundamental than others. For example, Is a right to life is more important than that of a human right to food, without which life cannot be sustainable, or more important than a social security right? Here, we have observed that such human rights are interdependent on each other. It is important to note that there is no clear distinction between the civil and political rights and economic, social and cultural rights. Essentiality: Human rights are very much essential for the material and moral upliftment of the human race. According to International law, every individual has certain rights which are inherent in all individual because of their existence as human being, irrespective of their caste, colour, creed, language, ideology or nationality. The concept of human rights falls within the framework of constitutional law and international law. It has been identified to defend by institutionalized means the rights of human beings against buses of power committed by the organs of the State and at the same time, it is to promote the establishment of human living conditions and the development of human personality. For an easy understanding, the concept of human rights can be understood as linked with the concept of equality. It is to be noted that all human beings are wanted to treat fairly and equally. Equality is a pre-condition for freedom of human being. The concept of human rights signifying the minimum rights of an individual versus his own State is as old as political philosophy. The foundation of human rights is the concept of non-discrimination. But, when we look into the history of mankind, there has always continuous to exist a wide gap between the concept and practice, between the abstract principles and their implementation. Human rights represent claims which individuals or groups make on the society. They include the right to freedom from torture, the right to life, inhuman treatment, the right to liberty and security, right to privacy, right to fair trial, freedom of thought, conscience, and religion, freedom of opinion and expression, the right to marry and the right to forma family, the right to participate in one’s government either directly or indirectly or through freely elected representative. Obviously, the very concept of human rights has gradually evolved over the past several centuries. It is immaterial whether we call these rights as inherent rights, fundamental rights or choose some other name. In fact, these rights by themselves have no fixed content as has been rightly remarked by Justice Mathew and most of them are ‘empty vessels’ into which each generation has poured its content in the light of its experience.